"We are waiting for instructions of the government for the military operation. Opening a forward operating base was part of these preparations," a military source said Thursday, speaking under condition of anonymity. Turkish Armed Forces (TSK) last week opened a forward operating base in southeastern Şanlıurfa province near the Syrian border with the attendance of Defense Minister Hulusi Akar and top military command. The base is planning to be used as the main command center in case of an operation to the east of Euphrates. 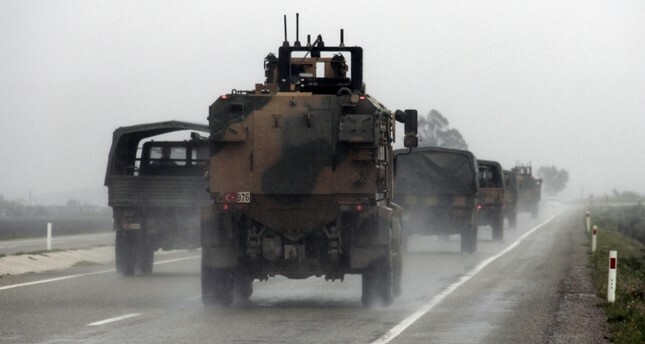 In December 2018, Turkish officials announced that Ankara is in preparations for a third offensive in northern Syria, this time east of the Euphrates, which is dominated by the PKK's Syrian affiliate, People's Protection Units (YPG) terrorists. Previously, Turkey conducted two offensives in northern Syria, Operation Olive Branch and Operation Euphrates Shield. The source also indicated that the Manbij road map has been sluggish and slower than initially planned due to the indifferent attitude of the U.S., adding that bilateral talks are ongoing to expedite the process. In order to prevent the PKK and its extensions from tightening their grip in northeast Syria and disrupting peace efforts in the region, Turkey aims to accelerate the Manbij process that was launched in June with the U.S. As part of the deal, Turkey and the U.S. agreed to work on the withdrawal of the YPG from Manbij. The aim of the Manbij deal is to ensure security and stability in the province by eliminating YPG terrorists who currently control the region in northern Syria and ultimately handing the administration of the province to a body consisting of local people. The military source also emphasized that the training process for Turkish pilots for the F-35 program continues, and there have been ongoing talks to resolve the recent disagreements on the issue. On Monday, the U.S. halted the delivery of equipment related to the F-35 stealth fighter aircraft to Turkey, marking the first concrete step by Washington to block delivery of the jet to its NATO ally as Turkish officials have refused to back down from the planned purchase of S-400 systems from Russia.